Good news: Rotary International offers the fully funded Rotary Peace Fellowship for Masters Degree and Professional Development Certificate for young professionals around the world. 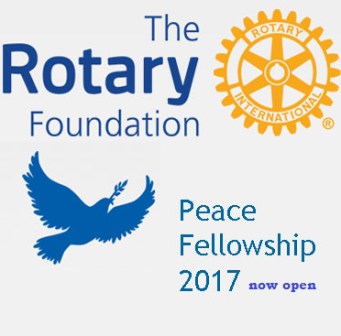 Application Deadline: Applications are now accepted for the 2018/19 Rotary Peace Fellowships program. Candidates have until 31 May, 2017 to submit their applications. Eligible Field of Study: Master’s degree studies in the fields of international relations, sustainable development, peace studies, and conflict resolution and professional development certificate in peace and conflict studies. Each year, Rotary selects up to 100 individuals from around the world to receive fully funded academic fellowships at one of its peace centers. These fellowships cover tuition and fees, room and board, round-trip transportation, and all internship and field-study expenses. In just over a decade, the Rotary Peace Centers have trained more than 900 fellows for careers in peace building. Many of them go on to serve as leaders in national governments, NGOs, the military, law enforcement, and international organizations like the United Nations and World Bank. Fellowship Type: Two types of peace fellowships are available. For experienced professionals working in peace-related fields who want to enhance their professional skills, Rotary offer a three-month program in peace and conflict prevention and resolution at Chulalongkorn University in Thailand. This program incorporates two to three weeks of field study. We award up to 50 certificates each year. Eligibility: The Rotary Peace Fellowship is designed for professionals with work experience in international relations or peace and conflict prevention and resolution. Fellows are committed to community and international service and the pursuit of peace. Recipients of Rotary Ambassadorial Scholarships or professional development certificate fellowships must wait three years after completion of the scholarship or fellowship to apply for the master’s degree program. Note: Candidates have until 31 May to submit applications to their district. Districts must submit endorsed applications to The Rotary Foundation by 1 July. Visit fellowship webpage for details and Apply now. Now that all the information about Fully Funded Rotary Peace Scholarship for International Students, to be taken in various countries has been delivered nicely; talented students who are eager to pursue their Free Tuition/Scholarships/Study with Rotary Peace for Undergraduate Bachelors, Masters, PhD, Associate Degree and Other Degrees, can apply now.